Compare this caricature of Billy Hughes to his photograph. Look at his facial features, expression and how he is standing. How has the cartoonist chosen to draw him? Why has the cartoonist exaggerated some features? 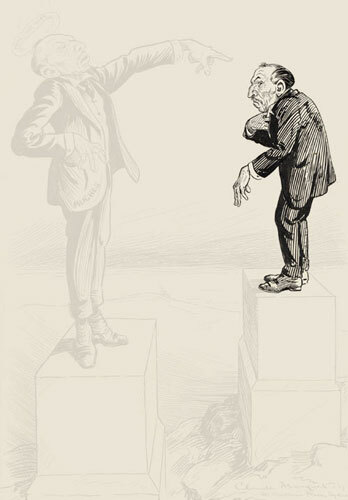 Describe the differences between the two caricatures of Billy Hughes. The caricatures seem to be talking to each other. What do you think they might be saying? 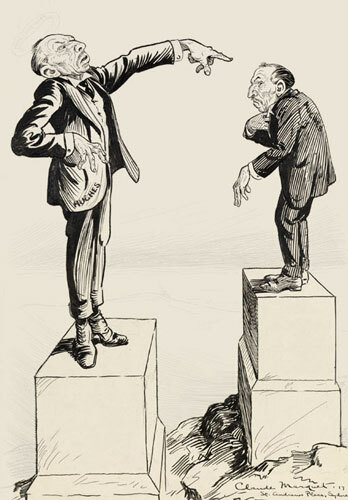 The cartoonist has drawn the two Billy Hughes on pedestals. What do you think this means? What was happening in Australia in 1916 and 1917? What issues was Billy Hughes dealing with? The cartoonist has written words on the 1916 pedestal to describe Billy Hughes’s policy on conscription. What is conscription? How does Billy Hughes feel about the issue? What do you think ‘I stand or fall by the issue’ means? On the 1917 pedestal is written ‘Conscription is dead’. How has Billy Hughes’s attitude changed? Think of reasons for this change in attitude? In small letters it says ‘if however …………”. What do you think this means? 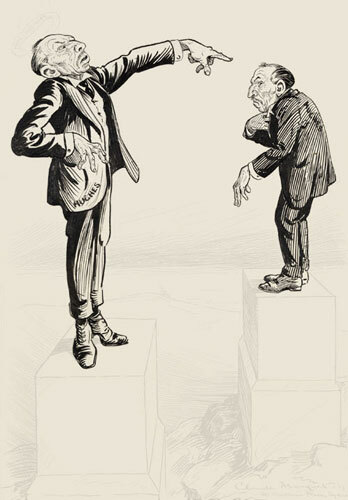 What has the cartoonist drawn around Billy Hughes’s head? What does it mean? How do the words ‘win the war’ relate to the words on the pedestal? Liar by cartoonist Claude Marquet was created in 1917. The cartoonist makes links between Billy Hughes’s statements on conscription in 1916 and 1917. Billy Hughes campaigned strongly to introduce conscription in 1916. To gain public support Billy Hughes asked the people of Australia to vote on the issue in a national referendum. He stated that conscription was essential for the Empire. The cartoonist shows his strong stance on conscription by the words ‘I stand and fall on this issue’. When the votes were counted 51% voted against conscription. During the 1917 Federal Election Billy Hughes stated that he might call another referendum ‘If national safety demands it’. A second referendum on conscription was called on 20 December 1917. The referendum failed again, this time more people voted no. Why did the cartoonist call Billy Hughes a liar?